"We need a fundamental re-architecture of the network," said Neela Jacques in his opening keynote presentation at the OpenDaylight Summit, concluding today in Santa Clara, Calif.
"We know that it needs to change," said Jacques, the executive director of the OpenDaylight collaborative project hosted by The Linux Foundation. Judging from several accounts, that change is happening, driven by software-defined networking (SDN). "OpenDaylight (ODL) is a highly available, modular, extensible, scalable and multi-protocol controller infrastructure built for SDN deployments on modern heterogeneous multi-vendor networks," the project states. 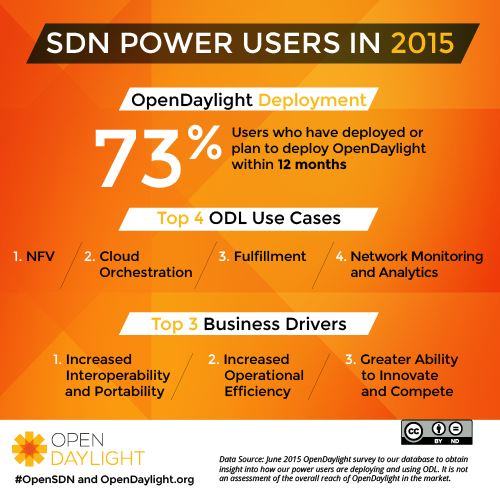 While SDN is still quite young and evolving itself, Jacques pointed out how OpenDaylight is helping to further the cause of new-age networking. Jacques pointed out the OpenDaylight platform has seen 300 percent growth in contributor participation since the release of its first edition, Hydrogen, just over 18 months ago. From 154 contributors then, the following Helium edition had 291 contributors, and the latest version, Lithium, received help from 502 participants. "Developers are voting with their feet," Jacques said, noting that other open SDN projects are also enjoying growth. From June of last year through June of this year, he said, 674 developers contributed to OpenDaylight and other projects, including Open VSwitch, Open Contrail, ONOS, Ryu and Floodlight. During that time, more than 24,000 code commits were recorded for those initiatives. Along with individual developer contributions, more sponsoring organizations are also joining the project, which this week noted the addition of AT&T, ClearPath Networks and Nokia Networks. Jacques said that more than 20 commercial products have been built on the OpenDaylight platform. 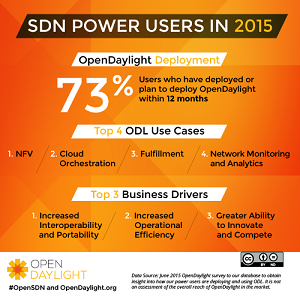 The organization just conducted its first-ever user survey that shed more light on OpenDaylight-based initiatives. 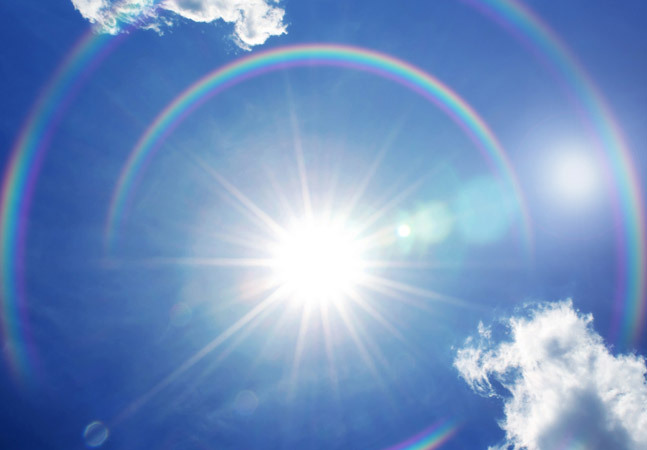 "The survey showed that 73 percent of users have already deployed or plan to deploy OpenDaylight in the next 12 months, with 24 percent in the investigation stage," the organization reported. The top use case involved network functions virtualization (NFV) implementations, reported by 72 percent of respondents. That was followed by cloud orchestration -- for example, OpenStack (54 percent); fulfillment -- for example, traffic engineering and quality of service (47 percent); and network monitoring and analytics (41 percent). The top business drivers were increased interoperability and portability of software systems; increased operational efficiency; and greater ability to innovate and compete. But the survey also showed there's room for improvement in the project. "What could we do better?" OpenDaylight said in a statement about the user survey. "The resounding response was documentation. This is relatively common for a nascent open source project and an area that the community is attuned to and putting renewed focus on. As a project we're helping where we can, creating training and providing a Web site with new and curated materials. We hope over the next couple releases you'll see great progress from us in this area." Those releases roughly follow a six-month cadence. Following Lithium, released last month, Beryllium is scheduled next, expected near year's end.